What are Digital multimeters, are they better than Analog Multimeters? Multimeters are tools used to measure current, voltage and resistance. They are very useful instruments that can be utilized in a number of fields, the primary users being electricians. There are two primary types of multimeters, one begin the analog and the other is the digital. The primary difference between the two is the display, an analog multimeter uses a needle to show the value, while a digital multimeter will show the results as numbers on a screen. Digital multimeters long ago replaced needle-based analog meters due to their ability to measure with greater accuracy, reliability and increased impedance. Fluke introduced its first digital multimeter in 1977. Digital multimeters combine the testing capabilities of single-task meters—the voltmeter (for measuring volts), ammeter (amps) and ohmmeter (ohms). Often they include a number of additional specialized features or advanced options. Technicians with specific needs, therefore, can seek out a model targeted for particular tasks. Test leads are flexible, insulated wires (red for positive, black for negative) that plug into the DMM. They serve as the conductor from the item being tested to the multimeter. The probe tips on each lead are used for testing circuits. 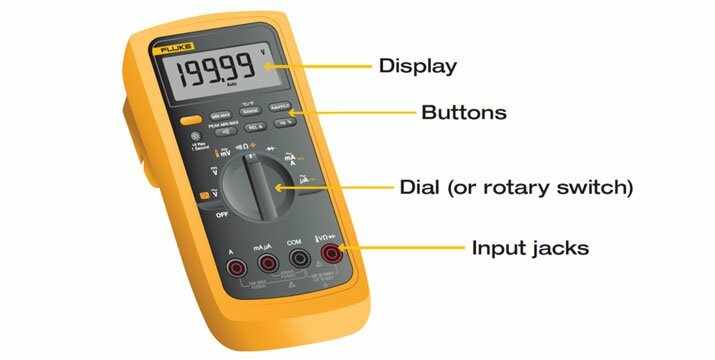 The terms counts and digits are used to describe a digital multimeter's resolution—how fine a measurement a meter can make. By knowing a multimeter's resolution, a technician can determine if it is possible to see a small change in a measured signal. Example: If a multimeter offers a resolution of 1 mV on the 4 V range, it is possible to see a change of 1 mV (1/1000th of a volt) while reading 1V. Digital multimeters are typicaly grouped by their number of counts (up to 20,000) they display. Each application with a digital multimeter presents potential safety hazards that must be considered when taking electrical measurements. Before using any electrical test equipment, people should always first refer to the user's manual for proper operating procedures, safety precautions, and limits. Overall, digital multimeters are much easier to read and provide more accurate readings. These days many analog multimeters are a thing of the past, and many professionals choose to use digital multimeters. Hopefully this article has explained the difference of the two multimeters and will be helpful when shopping for a multimeter.